When you were a child and one of your primary teeth became loose as its roots began to dissolve, you and your family were jubilant. As an adult, though, such an occurrence could be a cause for alarm. It helps to know how to respond in such a situation, to ensure that you can prevent a major dental problem and be fully restored as fast as possible. 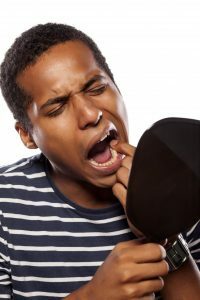 Bite down gently on the tooth to encourage it to stay in its rightful place. Next, be careful not to eat any food on that side of the mouth. While ensuring that your tooth stays in its correct location, you should immediately reach out to your local dentist to get the emergency care that you need. One thing to never forget, no matter the type of dental emergency you may find yourself or loved one in, is that although you may be able to temporarily stabilize the condition, the problem won’t just disappear. It requires that you get professional help to prevent a moderate emergency from morphing into something far worse. Now that summer’s here, you may feel more inclined to get out into the sun and participate in some type of sporting activity. If so, it’s important to wear a custom mouthguard to absorb any sudden trauma to the face. Another way to prevent a tooth from becoming loose is to practice excellent oral hygiene. If your dental care is neglected, over time, your gums can become irritated from the influx of bacteria and start to withdraw or retreat. As a result, your teeth can be left in an unstable flux, where they could fall out at any moment. Brush and Floss Your Teeth – There are a host of different ways to clean your oral cavity, but the most important two are brushing and flossing your teeth. While the former agitates and removes debris from 60 percent of your teeth’s surface, flossing addresses the remaining 40 percent by flexibly probing areas that would otherwise go unfettered. By removing harmful bacteria and plaque, this protects your teeth and gums and helps to prevent any instability at the roots. Visit Your Dentist – Paying a semi-annual visit to your local dentist will ensure that your teeth are in the best working condition. Furthermore, if any problems are lurking that could harm your oral health and cause the stability of your teeth roots to come into question, the issue can be addressed early. When it comes to restoring the health of your teeth, one of the best allies you have on your side is proactivity. By contacting your dentist at the first notice of a problem, you ensure yourself a full recovery and the ability to once again function as normal. Dr. Joe Kern has been practicing dentistry for over two decades yet remains just as passionate today as when he first graduated with his dental degree from The Ohio State University. For Dr. Kern, his daily motivation stems from a simple source – the desire to see smiles on the faces of his patients. He practices at Kern Family Dentistry and can be reached for more information through his website.